The brief was simple – get consumers to buy more of the product they love and create standout to attract new consumers to try Marques Casa de Concha. A normal on-pack promotion was not going to cut it with this audience so we conducted research into the motivations of the more discerning wine drinker to uncork what would be the perfect promotion to entice purchase. We needed to appeal to their thirst for knowledge and give them a reason to share amongst their social circles. We approached the Wine & Spirits Education Trust (WSET) – a globally recognised institution that specialises in offering education and qualifications for wine professionals and enthusiasts. We negotiated a partnership with Marques de Casa Concha for the first of a kind on-pack promotion offering consumers the chance to win a place on a WSET recognised wine course. This taps into the need for expanding wine knowledge. Entry to the competition was through a simple competition website where all entries were pooled into a draw. As part of entry process, data was captured about where the product was bought and which varietals are preferred. This information was used post competition to provide information on offers and product news. 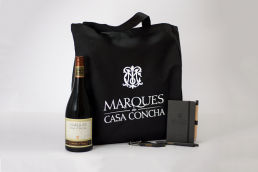 To help position Marques de Casa Concha as a premium wine and create a lasting impression with trade customers and journalists we designed a simple range of practical merchandise items for use at meetings, tastings and events.